Charlie Whiting says it is a “little bit speculative” to say that Halo saved Charles Leclerc from serious injury in a lap 1 crash at the Belgian GP. 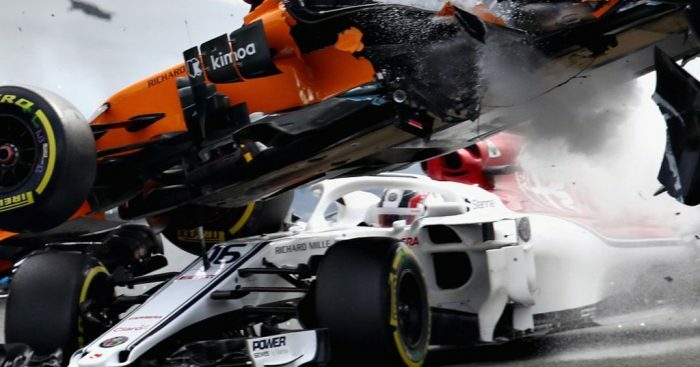 As the race got underway at the Spa-Francorchamps circuit, Nico Hulkenberg misjudged his braking into Turn 1 and collected the back of Fernando Alonso’s McLaren. The impact launched the MCL33 into the air, crashing over the top of Charles Leclerc’s Sauber. “I have never been a fan of the Halo but I have to say that I was very happy to have it over my head,” Leclerc, 20, said. It was evident that Leclerc’s Halo had taken much of the impact. “I flew over Leclerc’s car and the Halo was a very good thing to have today,” Alonso said. “Looking at the replay I think it helped him. It was a sentiment echoed by Mercedes boss Toto Wolff, who in the past has been very vocal about his dislike of Halo. Whiting, however, says it is too early to pass judgement on the role Halo played in protecting the Sauber rookie. “A little early to say,” he said. “The high-speed camera won’t tell us an awful lot, the on-board camera that we’ve seen so far is not particularly clear. “What is clear is the significant tyre marks on both the tyre and the Halo. We take a lot of photographs, and our researchers will be contacting Sauber tomorrow morning to make sure we understand, for example, when they take the Halo off, to see if the fixings and the bolts that fix it are in good shape, and more importantly to see if it’s been distorted. [It’s] being held in by the bolts at present, but see if it springs into a different shape. Asked if he agreed with others that Halo had saved Leclerc from serious injury, the FIA race director replied: “I think it would be a little bit speculative, but you can see it doesn’t take much imagination to think that the tyre marks could have actually been on Charles’ head. “It would have been a bit of a miracle if they weren’t had the Halo not been there. There’s a huge extent of the tyre marks, as you’ve all seen I’m sure.